If we have to base ourselves on market demand before 2008, the two daysailers that we propose are very small. At that time, generally characterized by a continuous increase in boat size, it seemed as though a daysailer could not be less than 12 m, (even better if it exceeded 15 m). That is not to mention many maxiyachts which, although they cannot be defined as daysailers, were routinely used by their owners as such, for daring voyages of few miles, between Porto Cervo and Porto Rotondo or between Portofino and Santa Margherita. Today, after the financial crisis, it seems that the trend is moving towards more compact daysailers. Our opinion has always been that small boats offer great advantages. It’s true that today it is said that thanks to the various gadgets (bow thruster, electric winch, etc.) even large boats can be handled effortlessly. However, it seems to us that this triggers a downward spiral for which the more gadgets you add increase the size the boat, which, being large, takes other devices, and so on and so forth. Instead, we have focused on small size and simplicity, which also means lower costs. However, this does imply a cheap boat. The quality of construction, the choice of technologically advanced and high quality materials, and the excellent level of detail imply a final cost relatively high. However, we prefer that the price is justified by the intrinsic quality of the boat rather than by the presence of frivolous accessories. The other aspects on which we focused our efforts were the study of efficient hulls, appendages, and sail plans. The daysailers must be fun, vibrant, and responsive boats to use, even if they aren’t made for competition. 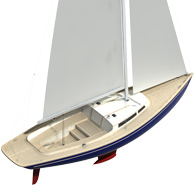 Therefore we designed a sail plan with generous sail areas and with the possibility to fit an asymmetric on a retractable bowsprit, an efficient keel, (though with a moderate aspect ratio in order to maintain a reasonable draft) and high efficiency rudders. The interior is basic, with simple berths for 2 or 4 people (respectively for the 24′ and 30′). These boats are, of course, meant to stay mostly outside, so we left more space in the cockpits, which are able to very comfortably accommodate 4 people (on Dafne 24′) and up to a maximum of 6 (on Dafne 30′). Given the size, a small crew or a single can handle the daysailers effortlessly.